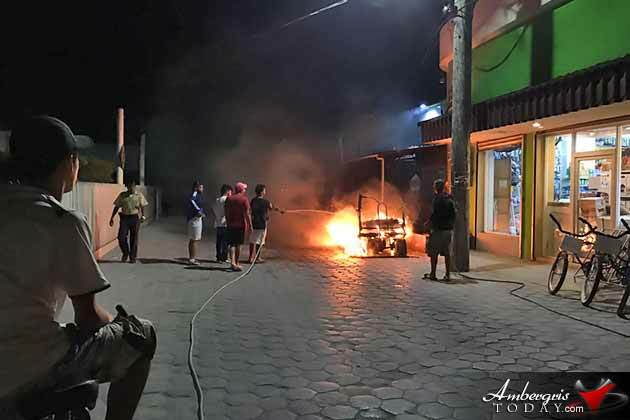 Three visitors to the island were left stunned and without a ride after their rented golf cart burnt down to a crisp in front of Island City Supermarket tonight February 20, 2017 just before 7p.m. “We rushed rushed from inside the supermarket when we heard there was a fire outside,” commented one of the persons who rented the golf cart. They were shopping at Island City after having parked the cart outside the supermarket on Coconut Drive. The golf cart was completely destroyed after it ignited and power was cut off in the area for a few minutes while it was being extinguished by the San Pedro Fire Department. The renters of the cart are astonished as to how the vehicle caught fire while parked. It is not the first time that a golf cart has burst into flames but it is not a common occurrence. The San Pedro Fire Department has launched an investigation to determine the cause of the fire.